Mom has been making these flour tortillas for years without knowing the name “tortilla”. She uses the word flatbread instead and she’s the best cook good at making dough based foods I have ever known. I really feel lucky as I’ve learnt a lot of recipes from her including these Homemade Flour Tortillas. 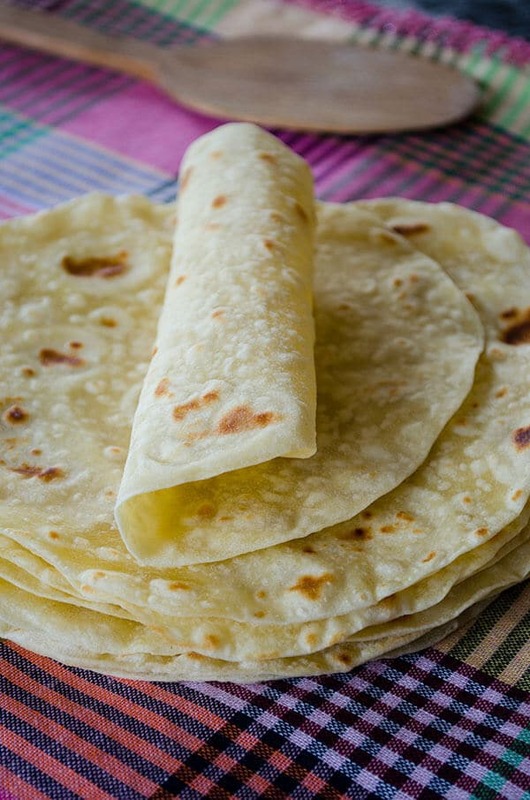 You might think that it’s crazy to make tortillas at home while you can use store-bought ones, but believe me you will love your version more! I’m sure you will want to give it a try when you read how it’s easy to make these, you just need 30 minutes or less to make your own flour tortillas. What’s more, you don’t need many ingredients and complicated kitchen tools for these easy peasy tortillas! 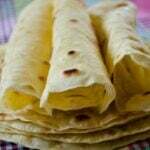 These are quite similar to the flatbread she uses for roll-up sandwiches, which are very common in the South of Turkey. 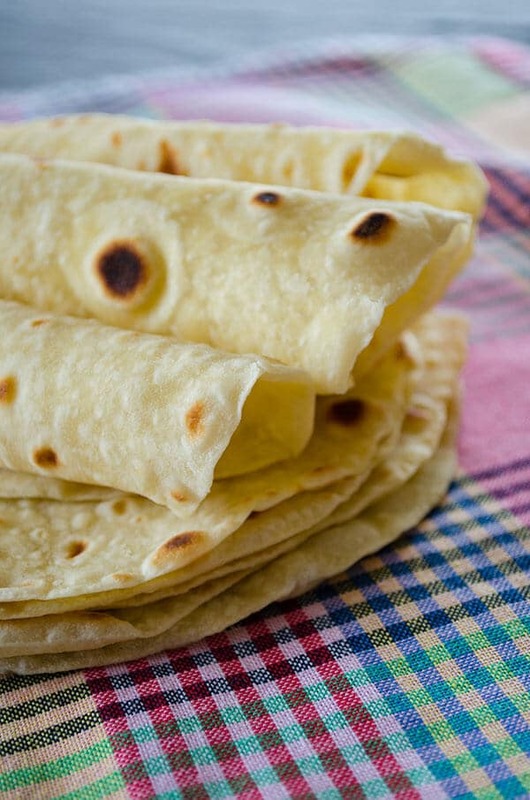 What she uses different in these flour tortillas is olive oil to make them more elastic and have a softer texture. I searched for other recipes for homemade flour tortillas to see if mom’s recipe is the same with them and saw that many of those recipes call for lard or shortening and baking powder. Mom’s recipe doesn’t have any of these, so I think we can call these healthy flour tortillas, can’t we? 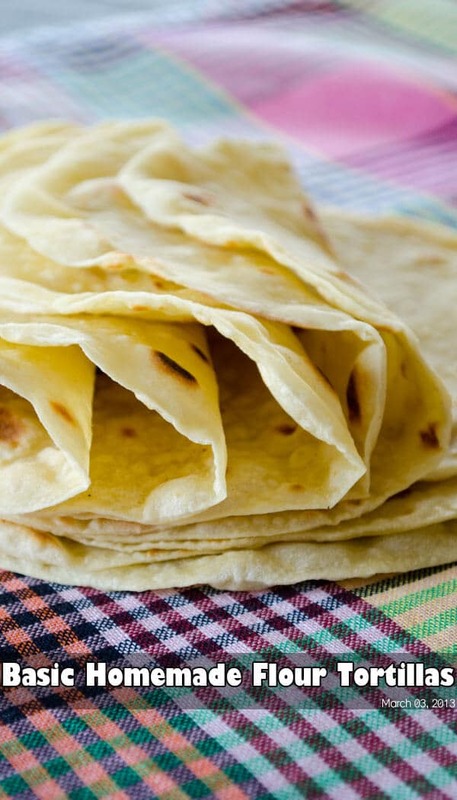 You need just 4 basic ingredients to make healthy flour tortillas; flour, olive oil, water and salt. We use white flour, but you can definitely use whole wheat flour instead. This is a no-yeast bread, so you don’t have to wait for the dough to rise. You just combine the ingredients, make small balls from it and roll them out. Besides it’s easier to handle this dough when compared to a dough with yeast. I mean the rolling process is a lot easier than a dough with yeast as this one is not as loose. You can prepare the dough in a food processor too, but mom always prefers to make it with her hands, and so do I. You don’t need to knead it a lot, just until it holds well. It should be a soft and non-sticky dough, so you can add a little extra flour or water if you think it’s necessary. 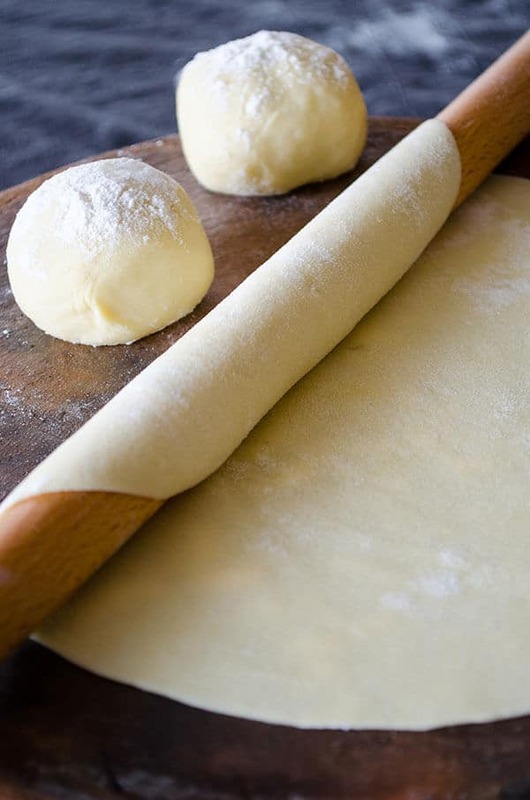 Make small balls and let them rest 5-6 minutes before starting to roll. You can sprinkle a little flour on each to prevent them from drying. Roll them out one by one on the floured counter and sprinkle little flour when rolling if it gets sticky. I recommend you to cook rolled out tortillas in a non-stick pan right after you finish rolling out each. Otherwise they might dry very quickly. I mean don’t pile up the rolled out tortillas, just cook one when you roll it out and then grab the second, roll it out and cook. Repeat this until you finish the balls or ask for help from someone in your family so that he can cook in the pan when you are rolling out. We do it that way. 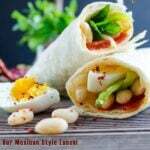 If you are alone and have to make it yourself and if you still want to roll them all and then cook, then you should cover the rolled out tortillas well with a kitchen towel to prevent them from drying. Another tip about these homemade flour tortillas is about the time when you take them from the pan. Prepare a big kitchen towel and cover them with it right after they are done and still hot. Let them rest under the towel so that they remain soft and felixable. If you don’t cover them, they get a bit crunchy and it gets difficult to stuff and roll them up. Combine all ingredients well except the extra flour. 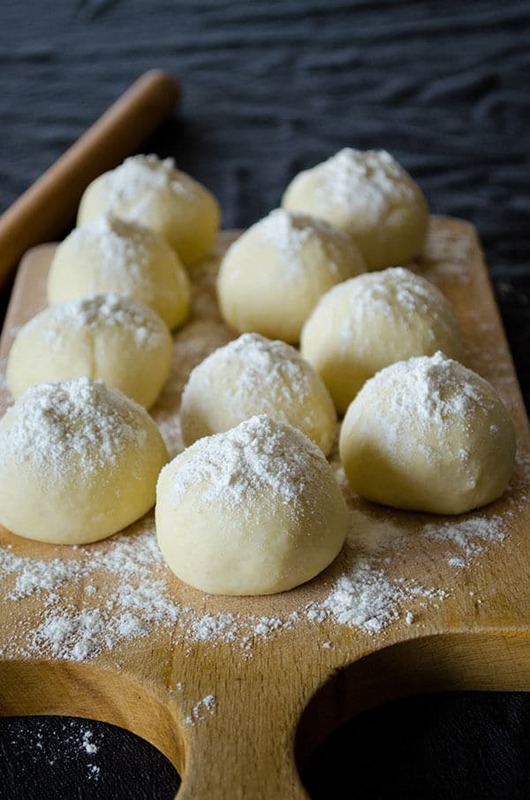 Make small balls from the dough. Sprinkle a little flour on each. Roll them out one by one on the floured counter. Sprinkle a little flour when it gets sticky. Cook in a non-stick pan every time you finish one. Cook one tortilla at a time for about 30 seconds each side. Cover them with a large kitchen towl well right after you take it from the pan. Pile them in the same place and let them cool under the kitchen towl. Love the recipe. Many other tortilla recipes add baking powder to theirs, but that doesn’t work for me because they don’t sell it in the little eastern European country I live in. Hi Rosa! Glad you liked the recipe! There is really no need for baking powder to make tortillas. What temperature do you cook them? I cook them over medium high heat but this might change depending on your stove. Is there a recommended way to store these before I cook it? Like if I want to make it a day ahead? And how long do they last? Hi Matthew, I have never tried making them ahead of time and then cook because they can easily get dry as they wait. Hi Jessica! I’m glad you loved these tortillas as much as we do. Thank you for sharing your feedback! Made these for my family and they fell in LOVE! I grape seed oil instead. Yummy. Awesome recipe. I really loved how simple and light they are. You control the calories based on ingredients. Roll out a large portion for a family burrito to share with at least six! Have fun with it. Thanks for the recipe. Blessings! Can u use vegetable oil instead? Hi Lexie, yes you can.